Jones, the 2014 gold medallist, and Hasselborg, who won it this year, had to work to the final stone to get their wins while Kim, the 2018 silver-medal winner, cruised to an easy, and early, victory. Jones beat Hannah Fleming of Scotland (1-6) 8-6, Hasselborg got by Binia Feltscher of Switzerland (2-5) 5-4 and Kim cruised past Yilun Jiang of China (3-4) 12-3 in six ends. The results left Sweden at 7-0, Canada at 6-0 and South Korea at 5-1. 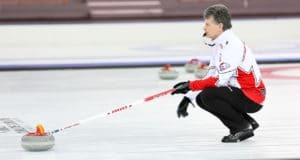 Jones, third Kaitlyn Lawes, second Jill Officer, lead Dawn McEwen, alternate Shannon Birchard and coaches Wendy Morgan and Elaine Dagg-Jackson needed a measurement to get one in the first end and stole two in the second when Fleming’s last-rock draw came up light. But the Scottish foursome got two back in the third, three in the fifth and stole one in sixth to take a 6-4 lead. 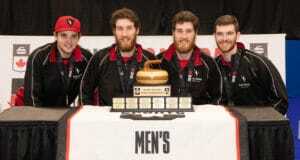 Canada got three in the seventh and when Fleming’s last-rock draw in the 10th rubbed a guard, Canada had its victory in front of another noisy crowd in the North Bay Memorial Gardens. 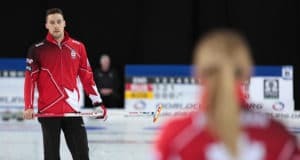 Hasselborg, who beat Kim for the gold medal in Gangneung, South Korea, last month, struggled early, giving up a single to the Swiss in the third and a steal of one in the fourth. But she made a perfect draw to the button around cover with her final stone in 10 to score two and take the narrow victory. “We love those draws and those shots,” said Swedish lead Sofia Mabergs, adding it was a good game to get the team back on track. In the only other game Anna Kubešková of the Czech Republic (4-3) scored three in the 10th end and stole one in 11 to nip Angelina Jensen of Denmark (1-5) 9-8. Victoria Moiseeva of Russia (4-2), Diana Gaspari of Italy (2-5), Tori Koana of Japan (3-3), Jamie Sinclair of the United States (3-3) and Daniela Jentsch of Germany (1-5) all had byes. The 2018 Ford World Women’s Curling Championship continues Wednesday with draws at 9 a.m., 2 p.m. and 7 p.m. (all times ET). Next: Curl4Canada gets underway Saturday at Leduc, Alta.